Pax Chingawale pedals his bicycle over 20 km a day, visiting his neighbours from house to house. 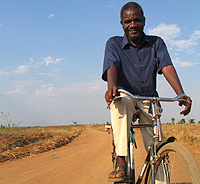 His travels take him to twenty villages, in Zomba District, southern Malawi, Africa. THE BICYCLE chronicles Pax’s journeys as he battles AIDS at the grassroots. Pax works with traditional healers who are influential at the local level yet often contribute unwittingly to the spread of the disease. He bikes around in search of the abandoned and the ill while monitoring the progress of those whose lives are being saved by ARVs (Anti Retro-Virals), a life-extending drug treatment. Pax is not a doctor or nurse. He’s a retired government auditor who volunteers with Canada’s Dignitas International, helping to create a model for making ARV drugs accessible to the world’s most vulnerable. Dignitas is headed up by Dr. James Orbinski, who accepted the Nobel Peace Prize for Médecins Sans Frontières. THE BICYCLE is an intimate look at AIDS through Pax’s eyes. It is the sobering yet inspirational story of how local communities can join up with global medical expertise to battle the world’s deadliest pandemic – and win.